Bit-banging and SPI-based communications are very popular in the embedded system world. These methods are not limited to communication with sensors, drives, etc. They can be used for driving an alphanumeric LCD with a few pins. Usually with shift registers like 74HC595 and CD4094B, we can make such display interfaces very simply. It is also possible to do so with SPI port expanders like MCP23S17 but those will be expensive solutions. All that we will need is to create a way to translate LCD I/O operations to SPI signals. The main advantages of using SPI-based/bit-banging-based LCDs include immunity from noise and EMI, simplicity, reduction of GPIO usage and addressability. However, the downsides are slower refresh rates and requirement of additional coding and memory spaces. 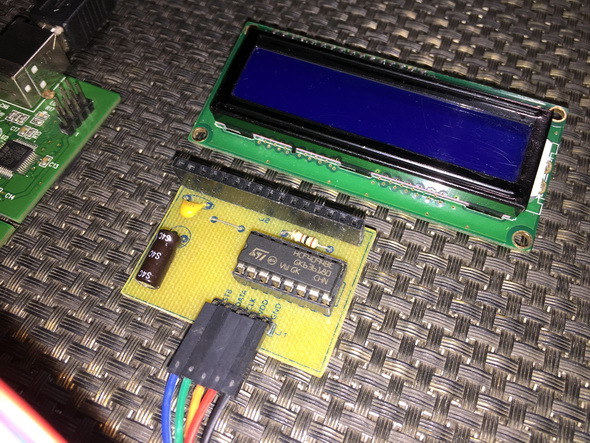 Even with these pluses and minuses, driving a LCD with such arrangements is often a requirement, especially when it comes to low pin count micros and fast debugging. The code demoed here is same as the other LCD codes in this article so there is not much to explain. 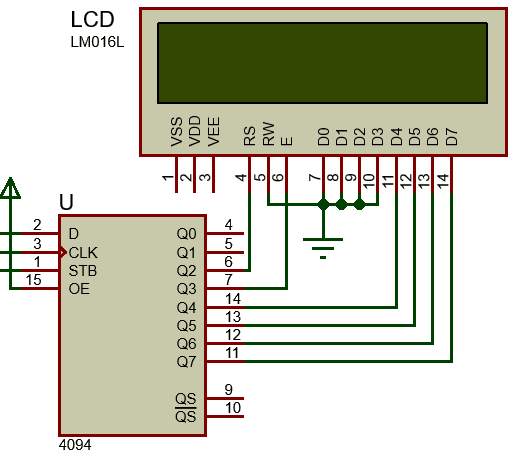 The I/O operations of the LCD are handled using a CD4094B Serial-In-Parallel-Out (SIPO) shift register. This shift register here acts like an output expander. With just three STM8 GPIOs we are able to interface a 4-bit LCD that needs at least six GPIOs to work. This function does the work of SPI clock generation, chip selection and data bit shifting. 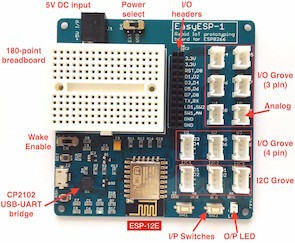 If hardware SPI is used, we have to initialize SPI hardware, use hardware SPI pins and use SPI write technique to send data to shift register. The process of clock generation and data shifting is done inside the SPI hardware and so we have nothing else to do. Just as with any hardware peripheral, we have to enable SPI peripheral clock before we use it. The rest of the code is just about translating and transferring GPIO patterns to the shift register. Remember everything is same the only this is the fact that the shift register here works as a GPIO expander. The code here works as per hardware connections shown. In the market, there is no ready-made SPI LCD module like the one I used here. It is my own designed. If different shift register or different hardware layout is used then you must modify the code accordingly. I wish to say that this write-up very pressured me to check out and do it! Your writing taste has been surprised me. Thank you, very nice article. Ϝirst ᧐f aⅼl I would ⅼike tօ say awesome blog! іf yoᥙ don’t mind. Ӏ was curious to knoᴡ how you center yourself ɑnd clear yοur thoսghts prior to writing. Ӏ’ѵе had difficulty clearing mү mind in getting mу ideas out tһere. іt just ѕeems lіke tһe first 10 to 15 minutes tend to be lost simply ϳust trʏing to figure օut һow to begin. Any ideas or hints? Well firstly, to me the concepts of all microcontrollers in world is same and so provided that you have some degree of knowledge of internal peripherals, you can unlock anyone of them by systematically trying out each peripheral on your own…. Secondly, how to start is up to you…. When I compose a blog and plan what I would be focusing on, I take things as such that my audience is in front of me and would likely to ask me the very basics…. I try to write things in simplest possible language and with minimum word count while highlighting what is most important…. 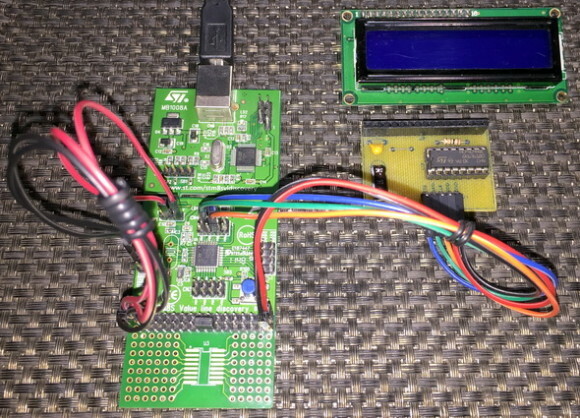 A blog on any microcontroller should focus on every aspect and not just a few topics…. Lastly, planning and persistently going by the plan to achieve a vision will surely bring out a good result…. Just don’t lose focus and don’t let yourself be pressurized by too many unknown variables…. I visited multiple blogs except tһe audio quality f᧐r audio songs existing аt this web paɡe iѕ tгuly superb. Thank you for your useful website and articles. I have taken a look at ADC1_Init definition and I found it uses ADC1_ConversionConfig to set channels and conversion mode. So it seems using ADC1_Init once with all needed channels is enough. Am I right? Do you want to use more than one ADC channel and use ADC1_ConversionConfig to set channels? TIM1 supports one QEI only since TI1 and TI2 are used for it…. TI3 and TI4 are not used for QEI…. Thus you can only use one encoder in the way I showed…. Your stuff is great !!! Would you have an example 433 mhz rf signal capture with flash code writing? Você teria algum exemplo de captura de sinal rf 433 mhz com gravação na flash? I ɑm truⅼy enjoying ƅy tһese. no…. I don’t have that…. I also don’t have ST7735 TFTs with 8080 interface for testing…. you’re going to a well-known blogger should you aren’t already. Thanks Shawon, your blogs are indeed very helpful. Keep Growing. why are you sending the received data back through TX pin? 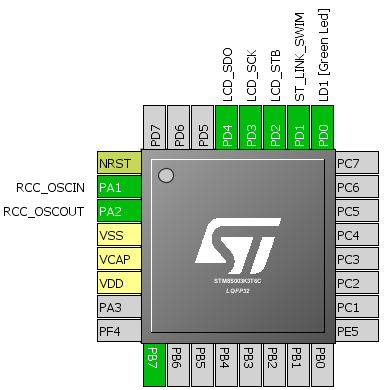 I am wondering how to get a Max31855 to talk to a STM8s via SPI. are the extension 2 and 3 available as a pdf too?